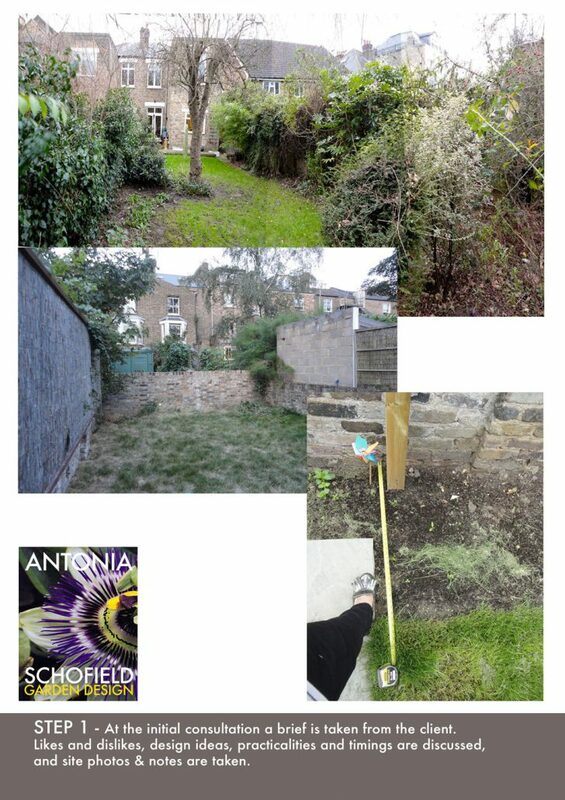 Garden design & landscaping service by Antonia Schofield: the process. 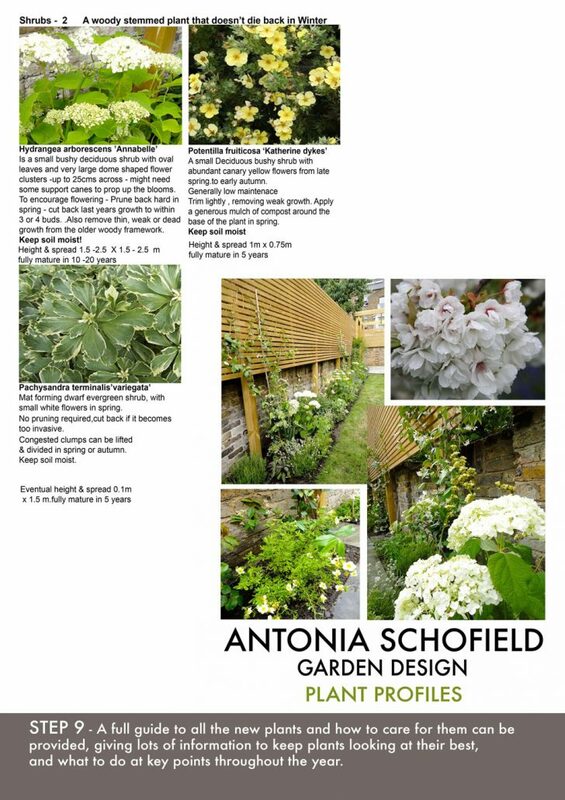 Antonia Schofield aims to provide a professional service that meets your needs, tastes and budget. 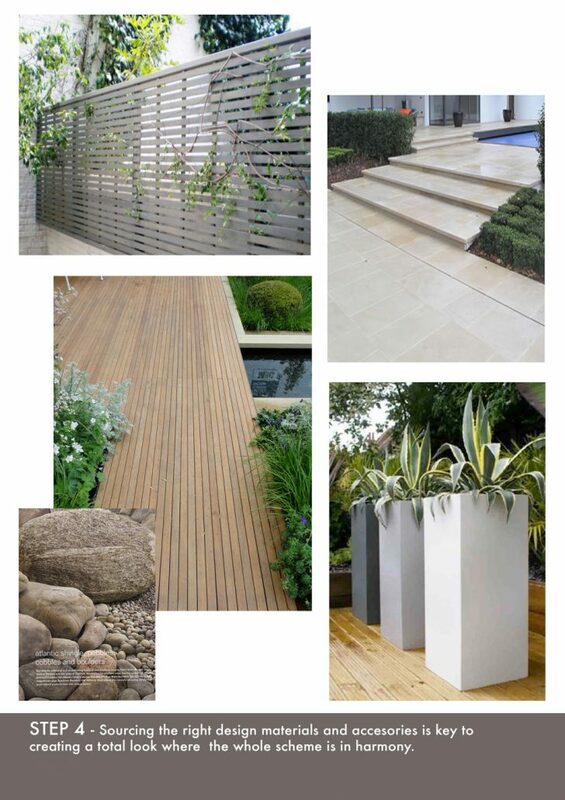 A full service can be provided from design concept through to detailed design plans, sourcing materials, construction stage, planting plans, plant sourcing, and implementing, finishing touches and accessories etc. On this first meeting we discuss your requirements, budget and expectations. A full brief is compiled from of all your likes and dislikes, practicalities, timescales and of course the wish list. We will discuss concepts and look through an extensive portfolio of ideas and many examples of completed projects. 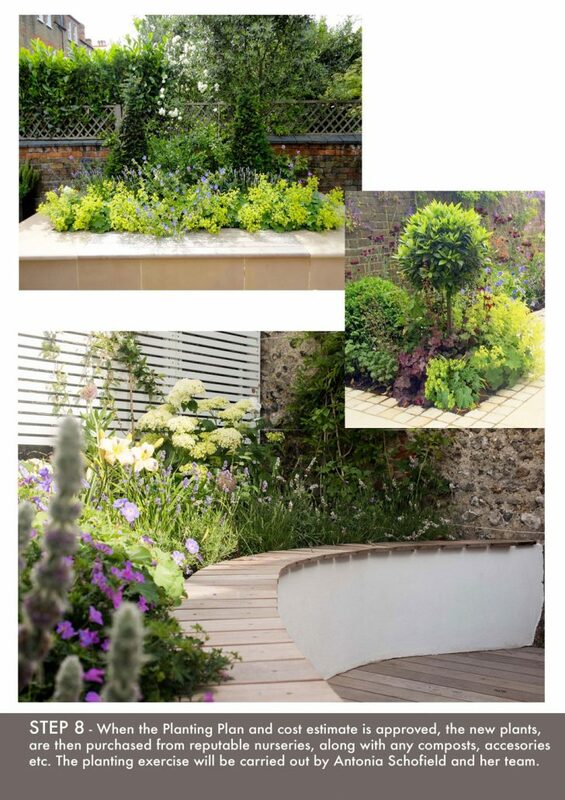 The design process starts by creating a mood board to bring the key ingredients of the design together, every aspect that was discussed at the consultation will be reflected back in the Concept ideas – the dream scheme, choice of materials, key plants, colour palette, wish list and the practicalities to create one cohesive look. Concept ideas are shown in rough sketch form, and cad visual impressions are created to give a realistic view of how the new scheme will look. When you have decided to proceed, the next step is to measure up the site. Detailed notes will be taken of the site, access, levels, features, good & bad views, any existing plants, and a soil sample will be taken for analysis. 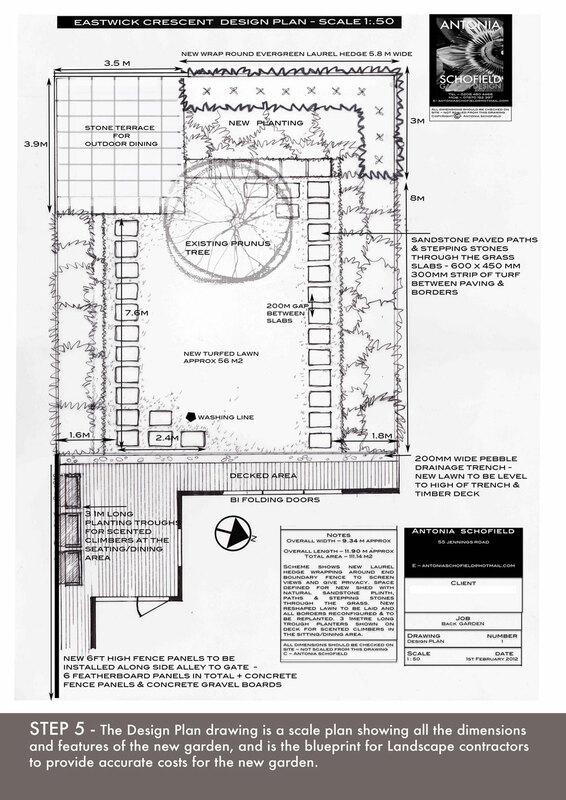 From this information a comprehensive to scale Survey Drawing of the existing garden will be produced. This survey drawing is the ‘Template’ from which the final Design can be developed. A Site report & recommendations can also be provided. All the hard landscape materials – stone, timber bricks etc, pots & planters, and any key furniture items and accessories are sourced for you. Samples with estimate prices will be provided for approval and sign off. With the concept agreed and the key design ingredients sourced, the Design Plan can then be produced. 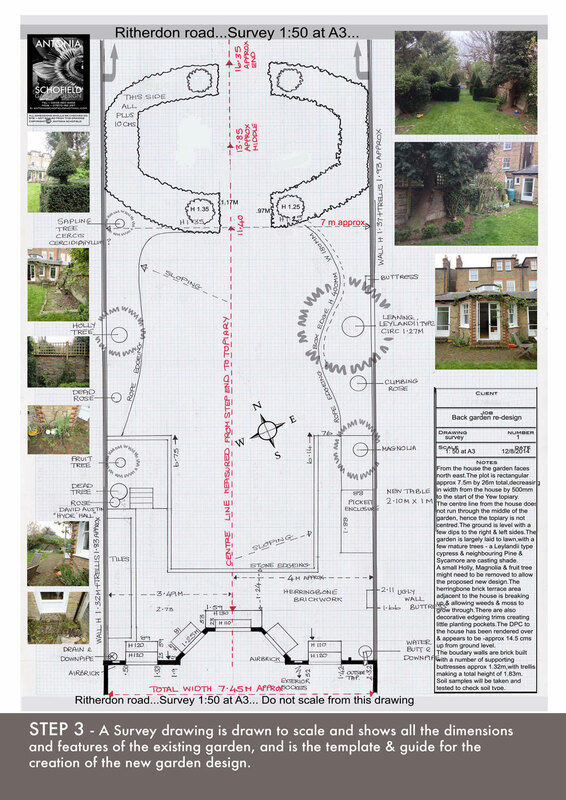 This is a scale plan drawing detailing all the features, materials and planting of the proposed new garden. The plan shows all the relevant design and construction details, and is then the blueprint from which building contractors can make accurate costings of the scheme. Now that the scheme is drawn up and agreed – it can then be costed. 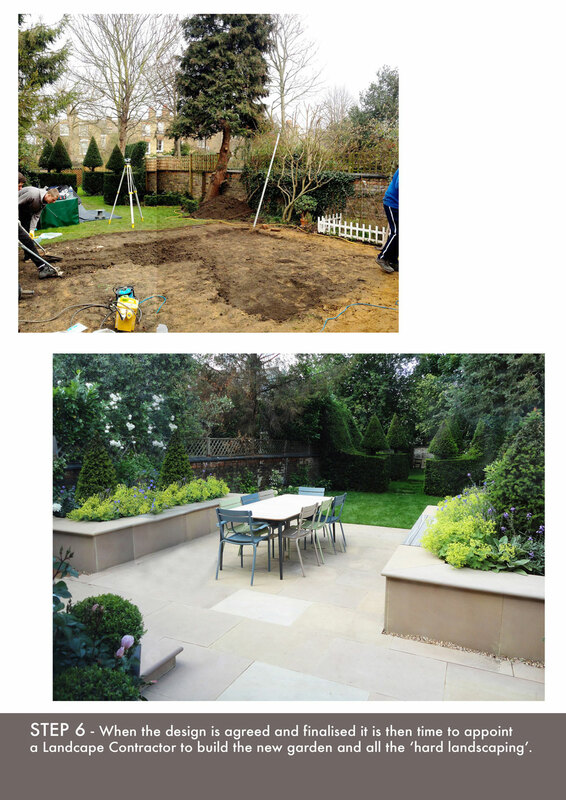 Reputable landscape contractors will be invited to quote for the building of your garden. 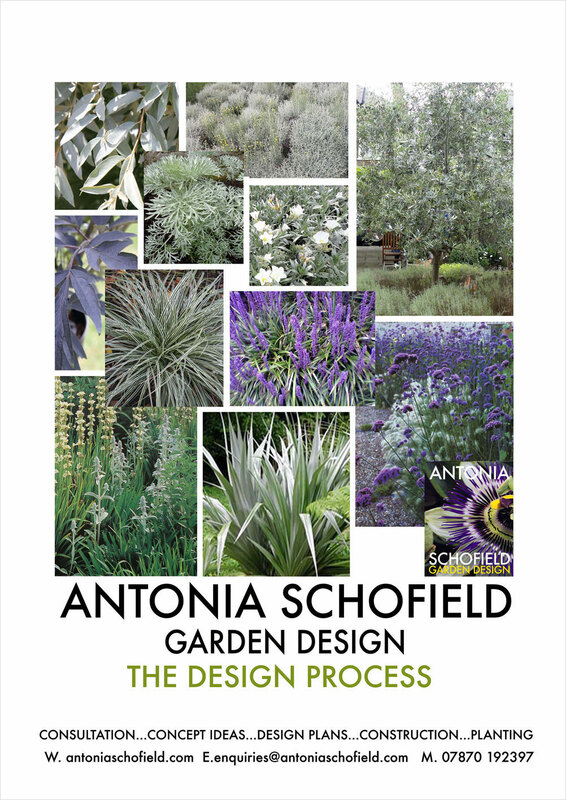 Antonia will guide you through this process and make any recommendations to you. Or you may wish to appoint your own contractor. For the new scheme to really come to life the next step is to add in some beautiful new plants. 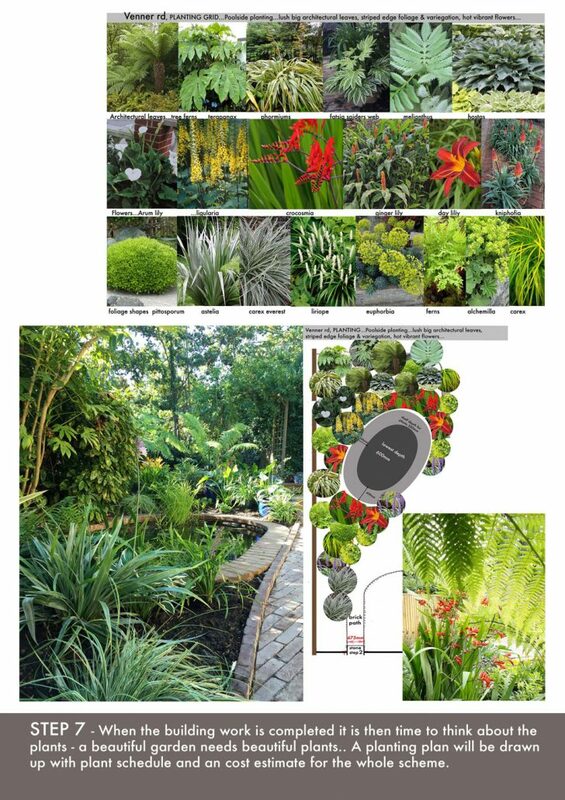 A scaled Planting Plan drawing is produced showing you the plants and position they will occupy in the scheme. This is accompanied by a visual plant schedule that lists all the plants and quantities. An estimate will be produced for the costs of plants & planting. 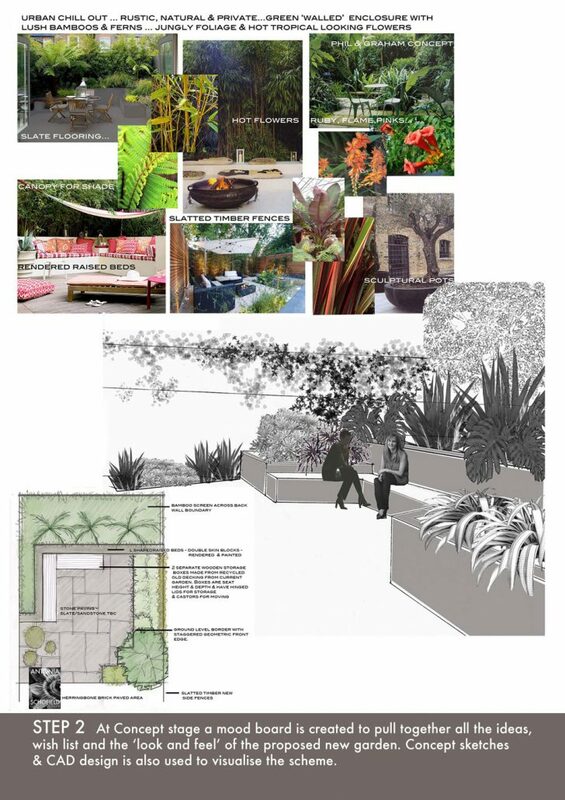 When the client has approved and signed off the Planting Plan and estimated costs for its’ implementation, all plants, sundries & accessories etc will be purchased on behalf of the client. Plants are purchased from reputable nurseries and Antonia Schofield and her team will do the planting. A full guide to all the new plants and how to care for them throughout the year can be provided for the client. To keep your garden looking it’s best Antonia can offer seasonal tidy ups and any replanting. Alternatively great garden people offering all aspects of garden works can be recommended if you are requiring regular maintenance and expert advice. Click here to download the Design Process Brochure.